Vince McMahon returned to WWE television for the first time in months and it was a welcomed surprise. 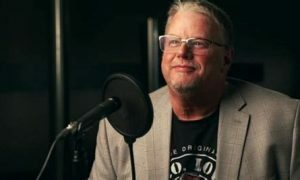 While it appeared that McMahon came back to set up the Survivor Series main-event, many are speculating that this was all the start of a long road to WrestleMania 31. 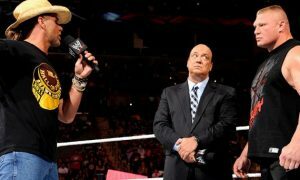 McMahon came back seemingly out of the blue on Monday Night RAW as part of the angle to set up the Authority’s team vs. Team Cena at Survivor Series. Vinnie Mac didn’t stick around long as he left after a vignette with Stephanie and Triple H. Stephanie and Triple H were excited to see him go and the dynamic is leading some to think that there are much bigger plans here than a Survivor Series headliner. The timing is what has people talking. At the very same time last year, Vince was booked to return to television. He was advertised as appearing on the television events and yet never appeared. Vince was set to take center stage in a huge WrestleMania 30 angle. The angle would have played out with Triple H and Stephanie fighting Vince for control of the company (an original angle of course). The story would have peaked at WrestleMania with a match between Triple H and either Stone Cold Steve Austin or The Rock. For whatever reason, the angle was scrapped and McMahon never made those appearances. Are we about to see this angle delayed? One thing is for sure. If we are seeing the angle, we aren’t going to see it peak with a match between Austin and Hunter at Mania. Austin has made it clear that while he is open to the idea of coming back for one more match, it won’t be in California. Austin said recently on his podcast that his schedule would prohibit him to train properly for a return this spring. Enter The Rock! Was it coincidence, a cute vignette, or the start of something big when The Rock and Triple H issued WrestleMania challenges back and forth on SmackDown 15? My takeaway from that skit was that the two were laying the groundwork for a match at WrestleMania 32. They clearly made it a point to mention stadium and attendance and that seemed more in line with the goals of 32 than 31. At the same time, many others observed that they were setting up a match at 31. It looks like I may be wrong…again. As for the angle, it sounds like I am reading a booking sheet for a RAW in 2002. I am sorry, this whole heel authority angle has been so played out that none of these stories get me excited anymore. Logically, it makes zero sense in the WWE from a continuity standpoint since you had the board remove Vince and Hunter a couple of years back for bad behavior, but that was a different lifecycle. Also, I find it hard pressed that fans are really going to be sympathetic to Vince McMahon in his fight for his company. 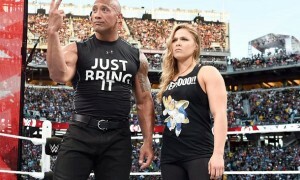 I also can’t think of a bigger waste of money than booking The Rock against Triple H. I am not opposed to seeing that match again but when you have such limited dates on The Rock, I’d think you can make better use of his drawing power against a newcomer like Rusev or a big-match situation like Brock Lesnar. Seeing The Rock fight for Vince McMahon against Triple H is probably the last idea I’d have on my list of booking plans for Dwayne Johnson. Unfortunately it looks like this angle is coming and there is nothing we can do about it. The positive is that we will probably get a lot of fun Rock interviews come this spring. The downside is that we will be bored to death with a McMahon vs. Authority feud before we get there.